Client involvement varies from project to project. Some give us 'carte blanche' over the site whereas others are more 'hands-on'. 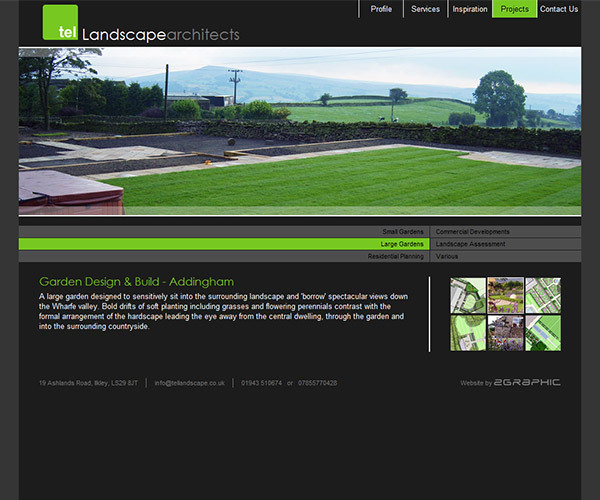 None more so than TEL Landscape Architects in Ilkley. Being very creative types themselves they created their own design and passed it to us to code up into a fully functioning website. We offered guidance and suggestions along the way to ensure their design would work as a website. The 6 project pages each detail 6 projects which would have been a lot of pages and page loads for visitors considering the amount content involved. We were able to code it so all 6 projects were in one page and the relevant one displayed when clicked.